I had surgery 10 months ago to correct hammertoes on my left foot. The doctor put screws in my 2nd and 3rd toe but not in my 4th. He just released some type of ligament(m.spelled). Anyway, I have been back several times expressing how much pain and discomfort I am having, but I can't get him to listen. 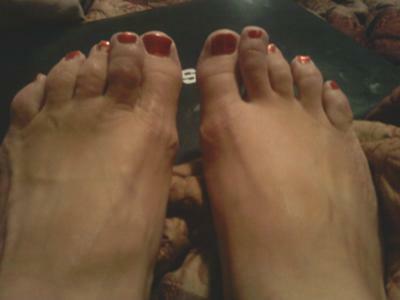 He keeps telling me it is scar tissue that is tearing loose everytime I do something that the toes aren't use to doing. It isn't that I think he is a bad doctor or whatnot, but it bothers me because he won't listen to me. Everyday my toes are swelling and they are hurting so badly. The 3rd toe hurts more than any of them. It mainly hurts in the toe itself. I call it the belly of the toe. It is the part that is right below the joint or knuckle of the toe but not all the way down to the foot. It also hurts when I try and put my finger between any of my toes (2nd/3rd 3rd/4th) . It is one of those hurt but feel good feelings. They ache so much that I have to rub them. Nothing seems to help them. I have had numerous cortisone shots, steroid packs, etc. My primary care physician has decided to order a MRI, but I am afraid nothing will show up due to the screws. That is what my foot dr. had said anyway. I just wondered if you had any suggestions or insight or any advice at all. By the way, I am a 30 year old female, school teacher(teaching 8 years), mother of 2 boys, and normal weight. I do have a herniated disc in my back, but it is right at bra strap, and I think it is T7-T8. I also have 2 others in my neck that aren't herniated, but they have something else wrong. They are C3-C4 and C5-C6. I was going to Physical Therapy for that, but my prescription ran out for it and I will have to go back to the doctor. Your definition of a "good doctor" and my definition obviously differ. A good doctor will still show interest in his patient even when things do not go as smoothly as anticipated. I do not know if this is the source of your problem but I am not a big fan of screws or any other permanent hardware in toes because it is too much metal in such a small area. I obviously have not examined you, but I do not think an MRI is going to show much and your family doctor probably is not the type of doctor you need to see. In my opinion, your best bet would be to consult with another podiatrist and get a second independent opinion. I wanted to write you back and first of all thank you for answering me. Also, I went to have the MRI and see my PCP. HE said the MRI showed osteoedema in all of the bones of the toes. He told me that he had spoken the physician who did my surgery and I should start wearing my boot/shoe that keeps my foot/toes immobilized. This way the swelling in my toe bones will go down. What he explained made sense, but I think and worry that the problem will just continue to come back. Do you have any advice on this?